What’s a cherry blossom festival like? Sakura blossoms don’t just show up on trees during springtime in Japan. Sakura blossoms show up everywhere - on clothes, in food, even in 7 Eleven. Since the event has been so popular for many hundreds of years now, you’re probably wondering what a typical sakura celebration looks like. Meguro River in Tokyo is my favorite spot to see cherry blossoms in spring. 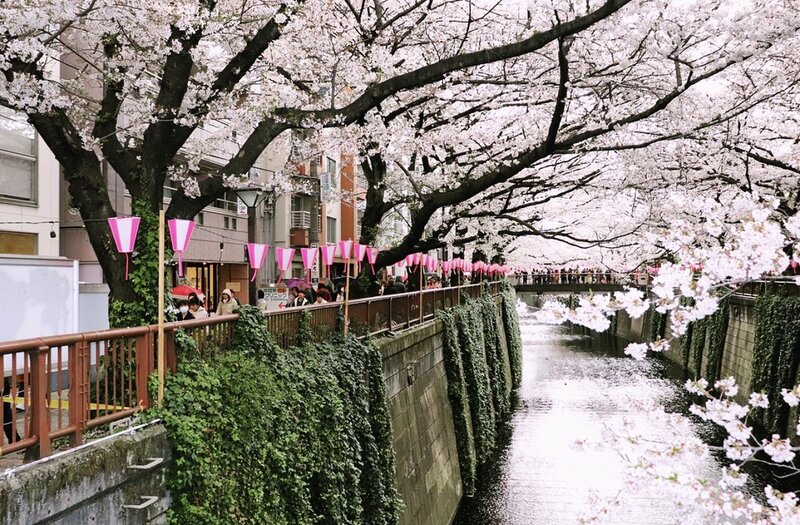 With hundreds and hundreds of sakura trees lining the sides, you’ll never be disappointed by the river’s beauty. Street vendors sell delicious food, warm sake helps fight off the chilly spring air, and pink glowing lanterns guide your way. Food is a must for any festival. In my opinion, sakura viewings, or hanami, have the best food - but only because I’m obsessed with sakura flavor. You can find sakura ice cream, sakura mochi, sakura sake - sakura everything there. 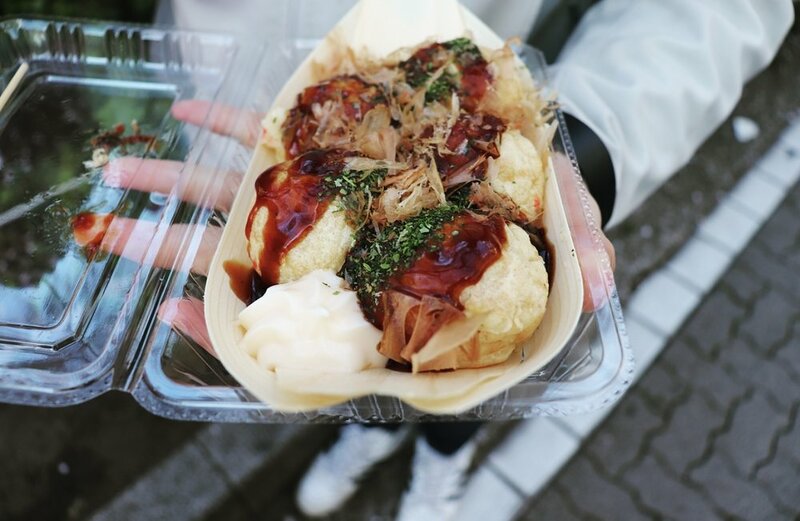 They also usually sell traditional festival meals like yakisoba, takoyaki, skewers, french fries, and more. What food did we buy? gyro - this is actually common at some festivals! If you go during a busy time of day, many people will be swarming the sides of the river, trying to take that perfect profile picture shot. Wait, you say you want to see ours? Why, we’re so happy you asked! If you come down to Meguro River, you can take beautiful pics, too! Talk about a two-in-one deal. The sakura blossoms are waiting for you! Click to learn more about the history of hanami, or sakura festivals, from our last blog post.